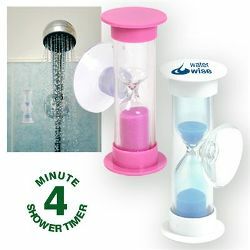 4 minute rotating timer with suction cup for attaching to glass shower screens. Reduce shower times and conserve water. This Product is part of our Green Conceptz Collection which promotes environmentally friendly, and eco friendly messages. ITEM SIZE(MM) 25L x 60H. PRINT AREA(MM) Top - 20Dia, Barrel - 38L x 8H. COLOURS Clear/White with blue sand, Clear/Pink with pink sand.